This is a game about discrimination. It recognizes the Dwarf King as the one above all, the King of Kings, the supreme namer of the game. It completely neglects the Goblin King and the Knight King – whom I would also neglect for his silly title, but never mind that – who are supreme rulers of the same rank. Rank being the operative word here because Dwarves, Goblins and Knights are the three suits in Bruno Faidutti’s trick-taking game The Dwarf King. At the core, The Dwarf King is the most simple kind of trick-taking game: there are three suits of cards with values from 2 to Ace (called Champion in The Dwarf King), one player starts the trick by playing one, everyone else follows suit if they can or discards if they cannot, the highest value card of the right suit takes the trick. After staring and giggling at the card illustrations for a moment, because Christophe Swal did an absolutely amazing job of them. Taking tricks is so easy, there’s not even a trump suit. But if the game was really that simple and boring, we wouldn’t be talking about it here. The kicker is, you don’t always want to take tricks, or at least not all of them. Only that sometimes, you do. Every round of The Dwarf King has different scoring rules. A scoring tile is drawn before the first card is played, showing two scoring rules. Only one of those rules is used, decided by the player holding the Musician of Knights, also known as The Five, that’s at least more sensible than The Symbol. There’s a wide variety of scoring rules available. A simple one might award one point for each Knight card that you takes in a trick. And maybe lose you one point for each Dwarf, because losing points is an option, too. A more complex scoring rule could give you five points for taking exactly two tricks, one point for each card in the longest straight you can build with your taken cards or, especially fun, one point for each trick the player to your right takes. Each scoring rule requires you to play a different strategy, some as easy as holding or throwing the right cards early in the round, but figuring out how to give points to the player to your right takes some thinking. Or just plain luck, because, lets face it, this is a card game that gives you much less control than Wizard, for instance, although the two are based on a somewhat similar idea. The only one with a minimum of control over everyone’s fate is the player deciding on a scoring rule, and even he might not have a good hand for either option. The scoring tiles also have a big difference in potential scores, and finishing the first of seven rounds with plus or minus 25 points is a difference that’s not easily caught up. 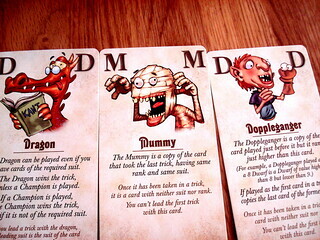 And because a game can always take some more randomness if it adds to the fun, there’s the special cards. Every round, one of these is shuffled with the rest of the deck and dealt out for additional chaos. Special cards come in two flavours, as ones and elevens in the three suits with the normal rules for following suit, and as colourless cards that have their own rules when they can be played. Both kinds have further disorder-inducing effects. The very powerful Enchanter for instance – he also goes by Eleven of Knights, not to be confused with Seven of Nine who is not in this game – doubles the score of the player who takes him in a trick, be it positive or negative. The Engineer of Dwarves gives three extra points to the player who takes the next trick after he was played. The Mummy becomes a copy of the card that won the previous trick, and the Wizard takes one card out of a trick just completed and adds it to his owners hand. More special cards add various more kinds of wackyness and not all of them are good for you. Let me just tell you how happy I was to have The Trump in a round where every trick cost me points. The Trump takes the trick it’s in no matter what. Yeah, go figure. So there is a lot of luck involved in The Dwarf King. Or bad luck, depending how you look at it. I’m saying this so you know it’s not a game to play in preparation for the next Wizard World Championship, strategy and counting cards may help you a bit in The Dwarf King, but ultimately it’s a game of chance. And a hilarious one at that, The Dwarf King plays quickly and with a big helping of schadenfreude, because everyone else gets screwed by the cards just as much as you. It looks great and is good for a laugh, that’s all this game wants to do and it succeeds.